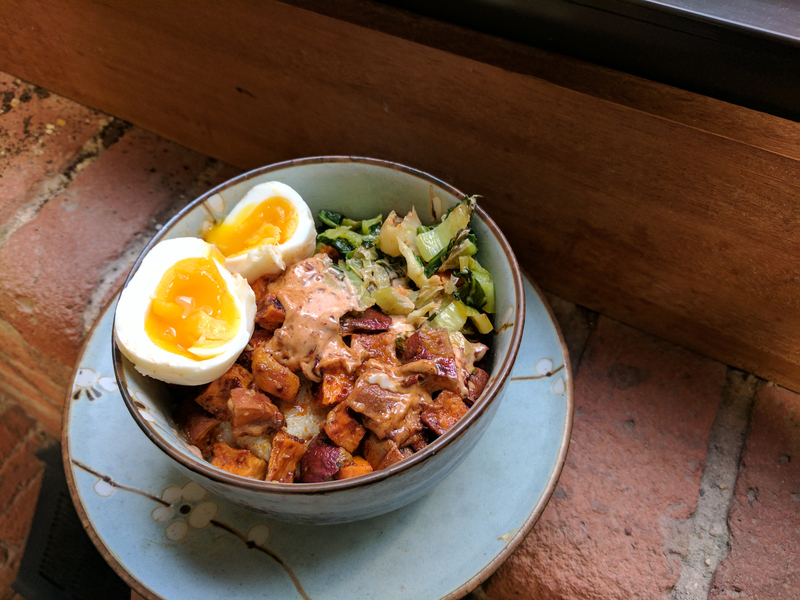 Last night, I made a grit bowl for dinner with a poached egg. It was great, and so were the leftovers, which I took to work with an easily transported soft-boiled egg. 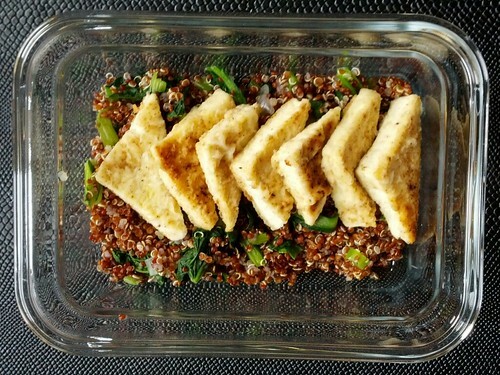 Summary: A filling, nutritious vegetarian meal that’s full of flavor. This recipe will make approximately six servings but is easily adjusted. Wash the sweet potatoes and cut into 1/2 inch cubes. Toss cubed potatoes with 1 tablespoon oil and chili powder, and roast on a rimmed baking sheet for 30 minutes. While the potatoes are roasting, continue the with the rest of the preparation. Press the garlic cloves using a garlic press, or chop them finely. Wash and cut the bok choy into thin slices, keeping the green leaves separate from the stems on your cutting board. In a skillet, heat the remaining tablespoon olive oil over medium-high heat and sauté the garlic until it is lightly browned, about 1 minute. Add the bok choy stems to the skillet, occasionally stirring until they are translucent, about 5 minutes. Then, add the leaves and continue stirring until they are wilted, about 5 more minutes. Set aside. Chop the adobo peppers finely. Stir the adobo sauce and chopped peppers into the mayo to taste. Cook the grits according to package instructions. In my case, I boiled 6 cups of water with 1/2 tsp salt and slowly added the grits, stirring. Then I reduced the heat, covered the pot, and cooked for 5 minutes. If using cheese, stir into the cooked grits. Season to taste. Poach or soft boil the eggs. To assemble, spoon a portion of grits into each bowl or lunch container. Top half of the grits with sweet potatoes and half with greens. Place the egg in the middle (you may want to clear an area for it first). 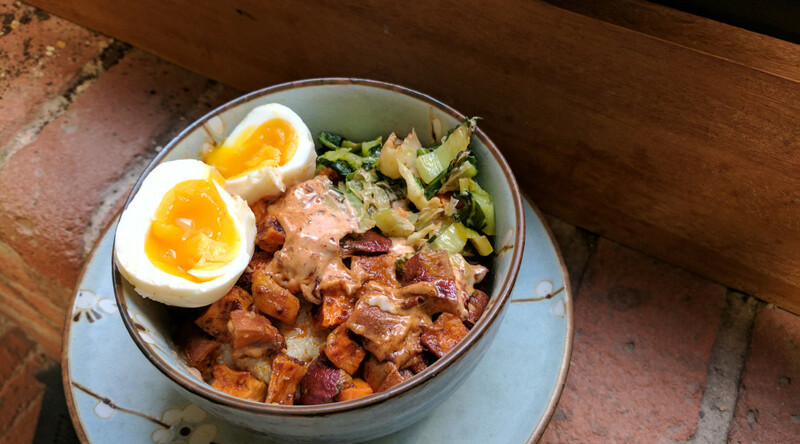 Top the egg with a tablespoon of spicy mayo. We’d just returned from a weekend out of town and Thursday’s vegetable share was waiting in the fridge. 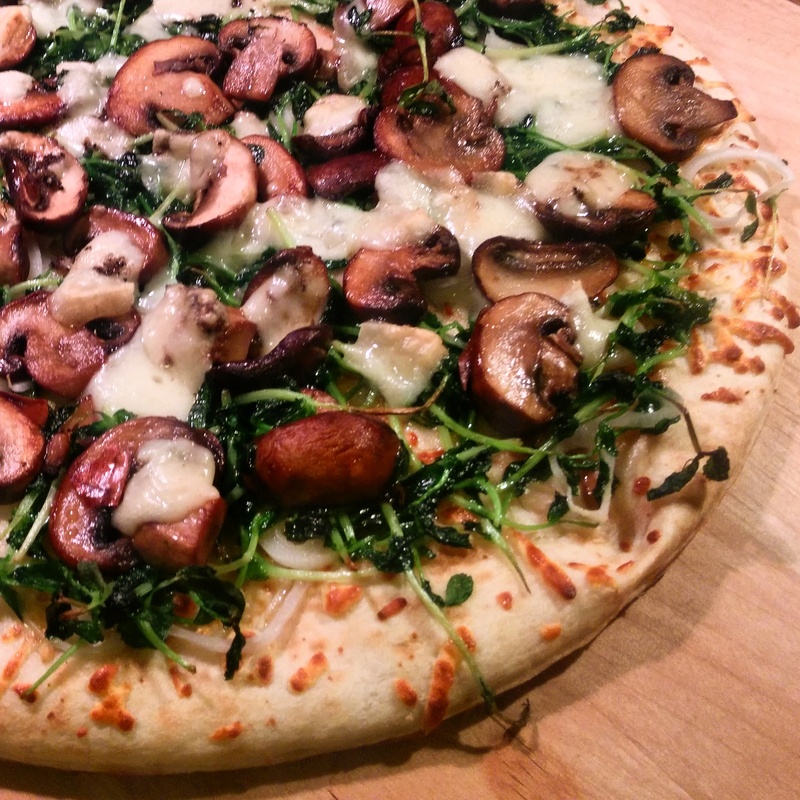 Two of this week’s items were cremini mushrooms from RI Mushroom Co. and pea greens from Allen Farms. We also had a stray shallot and some salty truffled cheese from Tony’s Colonial on Atwells. Since I was short on time, I picked up a premade pizza crust from the supermarket. What a scam! It was almost $5 and I’d rather be eating the crust I usually make from this recipe, which costs less than 50 cents a pizza. Still, it was a delicious and fast dinner. Put dough on a cookie sheet and brush with olive oil (I transferred mine to a pizza stone, whatever you prefer). Slice shallot thinly, separate into rings, and spread over the crust. In a large sautée pan, melt 1 tbsp of butter over medium high heat. Add pea greens and stir until evenly wilted, about 2 minutes. Spread pea greens over the crust, and top with a grind of salt. Wipe out the pan and melt the other tbsp of butter. Add mushrooms and a pinch of salt. Stir the mushrooms frequently until they let off and then reabsorb their liquid, about 6-8 minutes. Spread the mushrooms over the crust. Crumble the truffle cheese over the pizza, and top with a final grind of salt and pepper. Bake in the preheated oven 8-10 minutes. My refrigerator’s produce drawers have been heavy with winter vegetables from our produce share. Marveling at the beautiful orange of my beets and carrots, I did what few childless cooks do – sneakily hid vegetables in mac and cheese! I would go so far as to say they were completely undetectable. I like to bake my Mac and Cheese, but this is also good served out of the pot. Summary: Staunch Velveeta fans will have no idea how many vitamins they’re consuming in this tricky, bright orange Mac and Cheese. Preheat the oven to 400, start heating your pasta water, and butter a large souffle dish or rectangular baking pan. Slice the carrots and barely cover with water in a saucepan. Simmer until quite soft, about 15 minutes. While the carrots are cooking, start the sauce: melt the butter in a large saucepan, whisk in the flour, and add the milk. Bring the sauce to a boil while stirring, then lower to a simmer and cook for about 5 minutes, stirring occasionally. In a food processor, puree the carrot slices and diced beet with enough cooking liquid to make a baby food-like consistency. Make sure it is really, really, smooth, stopping to scrape bits off the side if necessary. (I processed for 3-5 minutes). Stir the bright orange puree and cheese into the sauce, stirring until the cheese is melted. Season with salt and other seasonings if desired (I used a dash of garlic powder and cayenne). Don’t skimp on the salt. Cook your pasta according to package directions, drain, and toss with the sauce. Pour into the prepared baking dish, top with breadcrumbs, and bake for 30 minutes. Restaurant portions can be huge, so I’ll often end up with leftovers. Some people have a serious aversion to leftovers (I don’t get it), and others eat cold pizza or Chinese food for breakfast the next day (I don’t get that either). My favorite thing to do with leftovers? Freeze them in small portions for work lunches. I’ve talked about my dedicated work lunch freezer drawer, and while most of it is home cooked, it’s great to bring along a memory from a favorite restaurant. 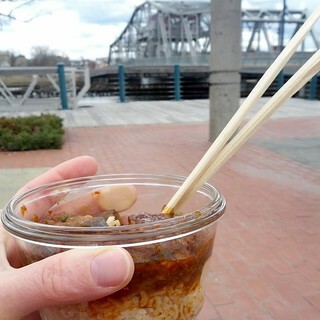 Yesterday was the first afternoon warm enough to eat my lunch outside, and I enjoyed Eggplant and Shrimp with Garlic Sauce over rice, from Gold Stone. We’d been over a month ago and it was great to revisit the tender eggplant and flavorful sauce. Another way to enjoy leftovers is by transforming them into another dish. We came home from Gold Stone with a lot of rice, so I made the extra into rice pudding – just simmer with milk, sugar, raisins, and spices for a half hour or so. Sometimes I’ll bring home a choice piece of meat or fish to eat on a salad the next day. If you’re not fond of leftovers, why not make a completely new meal out of them? I’ve made all of the components of this meal separately, but this weekend I thought I’d put them all together to make a fun, informal meal for guests. 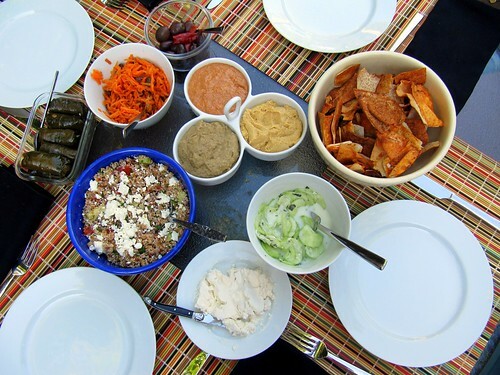 This is a low-stress dinner party because almost everything can be made ahead and you can supplement with store-bought extras like pita bread, olives, and a tasty feta (try the Hungarian feta from the deli case at Sonia’s). For dessert, pick up some good dates – or if you are lucky like us, one of your guests will bring a delicious olive oil cake. Bonus: this makes for great leftovers. 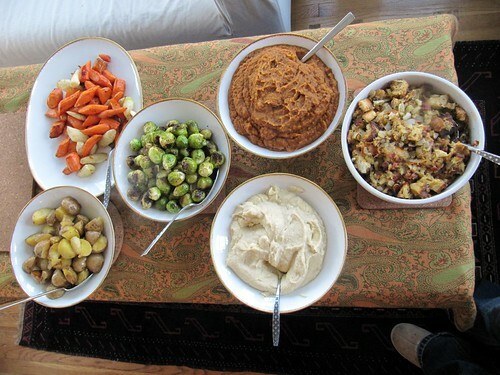 I have to admit that the photo below is actually the leftovers, which we ate tonight with a couple of friends! After a fishing trip to Alaska last year (which I still need to blog about), we have some large pieces of salmon in the freezer. As someone who rarely cooked fish before, this has given me a wonderful opportunity to try new recipes and cooking techniques. The large pieces sometimes mean several days of salmon. Crafting a new meal out of leftovers is a creative exercise of which I’m very fond! Here’s how I got three delicious meals out of one generous piece of salmon. Dinner: White wine-poached salmon topped with Pungent Parsley and Caper Sauce. Green and yellow beans almondine. 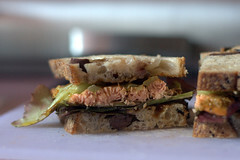 Lunch: Salmon sandwiches on 7 Stars Olive Bread spread with leftover Parsley and Caper sauce. Brunch: Salmon cake benedict on 7 Stars Olive Bread with bearnaise sauce. The leftover salmon and sauce made 5 salmon cakes when mixed with some onion, egg, old bread, and spices. Sometimes, leftovers can be quite luxurious.